To test power packs, the black measuring probe with the spring pin must be inserted into the high-voltage socket of the power pack (photos 3, 4). After pressing the red push button, the LED will illuminate green if the unit is functioning correctly. In case of malfunction, the LED will illuminate red. 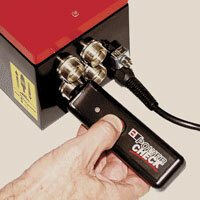 The Powercheck and the Combicheck are each calibrated as standard. 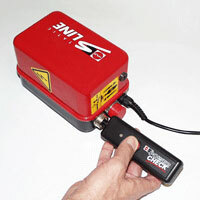 In the case of the Combicheck, only the function “Testing of power packs” is calibrated. 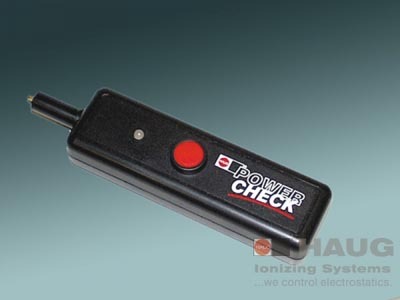 The function “Testing of ionizing units” cannot be calibrated. To protect the units against ambient humidity, the measuring probe is protected with a cap in both units. In the event of insufficient battery voltage, the diode does not light up after the red pushbutton is pressed on the two units (Powercheck and Combicheck). To change the battery, remove the battery compartment lid by pushing back the snap-in tab.